View More In Acoustic Blues. Is it the Grateful Dead? Well, in name, no, but in music and personnel, heck yes! We're very pleased to present a rare, unknown recording of the Grateful Dead from April 18, 1970, at the Family Dog in San Francisco, a show that was played entirely acoustically. In May 2013, Mountain Girl called to say she had a few reels of Grateful Dead music and wanted to return them. They turned out to be from 1970 and 1971. Jeffrey Norman quickly backed them up, and we were able to check them out. Sure enough, this was music we'd never heard before, nor knew it even existed. One of the coolest things in this small stash was the 4/18/70 tape. 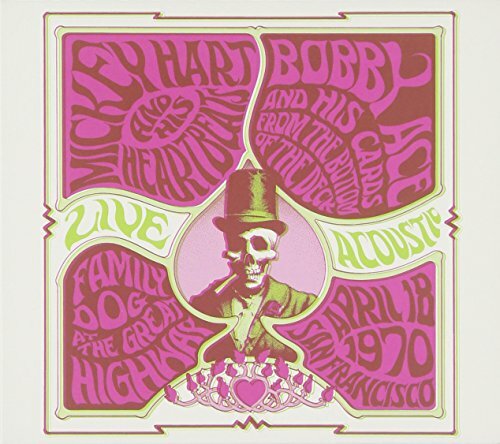 We knew the Grateful Dead shared the bill this night with Charlie Musselwhite, and the NRPS, but they billed themselves as Mickey Hart and His Heartbeats, and Bobby Ace and His Cards From the Bottom Of The Deck. What the tape reveals is that they played just one set, an 80 minute acoustic opus featuring some expected stuff from the era, plus some shockers.